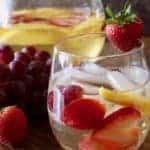 White Sangria, or sangria blanco, is a wine-based drink with fruit and brandy topped off with club soda. Served over ice, it’s a refreshing summer sipper. Combine sugar and water in a microwaveable container. Heat just to a boil, so sugar dissolves. Pour sugar syrup into a glass pitcher, add wine, Calvados, and fruit. Refrigerate at least 4 hours. To serve, stir well, pour into glasses, top with a good slash of sparkling water. Garnish with some of the fruit. The great thing about this recipe is that you can use the fruit you have on hand.